It's no secret that Argentina has recently joined Taiwan and Iran as a country in the midst of a cinematic "New Wave." Son of the Bride was recently nominated for a Best Foreign Language Film Oscar, and that film's charismatic star Ricardo Darin has also been seen in Nine Queens and Samy y yo. 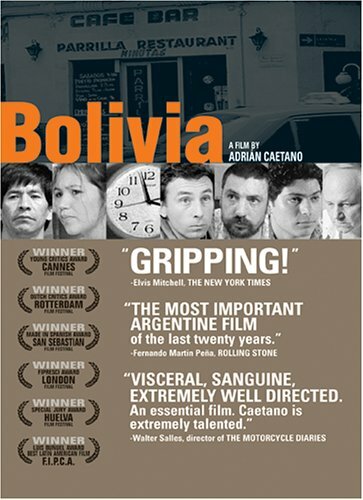 But even those good movies pale beside some of Argentina's more powerful films like La Cienaga (2001), the forthcoming Suddenly and the new Bolivia, which opens Friday at the Roxie for a week's run. It would be easy and obvious to describe Bolivia as "depressing," but that's selling it too short. Like some of Hollywood's best 1970s-era films, Bolivia is far more exhilarating than depressing. Watching a great storyteller like writer/director Adrián Caetano unfold such a simple and startling tale offers a source of great pleasure. Freddy Flores stars as Freddy, a Bolivian immigrant who lands a job as a cook in an Argentinean greasy spoon restaurant. His boss Enrique (Enrique Liporace) hires him -- illegally -- for a few measly pesos a day, and they both work with Rosa (Rosa Sanchez), who may not be the most beautiful woman in the world, but she's easily the most beautiful woman in this crummy neighborhood. The cafe's regulars come and go, drinking coffee or beer, watching violent soccer and boxing matches (including a Tyson-Holyfield bout) and making racist comments. Shockingly, one of them uses the "n" word to describe Freddy. Caetano builds his conflict slowly, showing one disgruntled customer Oso (Oscar Bertea) complaining about his financial troubles in some detail. Enrique won't allow Oso's tab to get too high and Freddy inadvertently enters the fray over a greasy sausage sandwich that the customer wants but Enrique won't let him have. It's easy to see how a lesser filmmaker would depict this situation in black-and-white, with a clear good guy and a bad guy, milking the final confrontation for all the action it's worth. Caetano is more interested in building characters that reside in a tension and despair-filled country. Yet this same story could just as easily be set somewhere in Big City America. Working with a compact 75 minutes, Caetano doesn't waste a single shot. Instead he provides complex reflections of conflicts past and encounters to come. A scene of Freddy getting hassled by the cops mirrors later scenes in the restaurant, and a scene of Freddy falling asleep in a different caf� mirrors an earlier one in which Enrique makes him discharge similarly sleepy customers. In one scene, Freddy calls his wife and three daughters at home, but later -- in a drunken haze -- he makes a play for Rosa. When Rosa tells him to think of his daughters, he replies, "my daughters are sleeping!" Unlike the noble, gentle immigrant hero of Dirty Pretty Things, Freddy is capable of giving in to pressure, rage, sadness, pain and lust. Watching Caetano's grainy, black-and-white little film with such bone-cutting poetry reminded me of the pure energy generated by Dog Day Afternoon or The Conversation. Argentina and the USA are both suffering through lagging economies, but while one tries to cover up its pain with soulless, plastic summer movies, the other knows how to really let loose and howl.